Our Executive Presbyter, Ralph Hawkins, preached at the Rich Hill and Harlansburg churches on October 4. He attended the national PCUSA Polity Conference (October 9-12) in Portland, OR, an advance meeting for the 2016 General Assembly, also in Portland. He will be preaching at Ebenezer church (October 18) and visiting Stoneboro church (November 1). With members of presbytery’s Sudan Team, he will be attending the national PCUSA Sudan Mission Network meeting in Louisville (October 19-20). Ralph welcomes opportunities to preach or bring greetings during a worship service, as well as opportunities to visit Session and Deacon meetings. Schedule a Sunday or a meeting time by contacting him at 724-528-1610 or ralph@shenango.org. At our September presbytery meeting, the body approved a 2016 minimum effective salary for full-time installed pastors of $48,617. This figure is for “effective salary” and does not include other costs associated with normal Terms of Call for installed pastors, such as participation in the Board of Pensions benefit program, etc. Although many congregations use the percentage increase approved by presbytery as a basis for raises for pastors or church staff, note that only the minimum effective salary dollar amount is mandated by the Book of Order. For questions about these figures, contact the presbytery office or a member of the Committee on Ministry. For a copy of the 2016 TOC form, click here. Shenango Presbytery was represented by 5 persons at a recent Sudan Mission Network meeting in Louisville, Kentucky — an annual gathering of Presbyterians with interest in and partnerships with the Presbyterian churches in Sudan and South Sudan, Africa. The gathering was addressed by Rev. 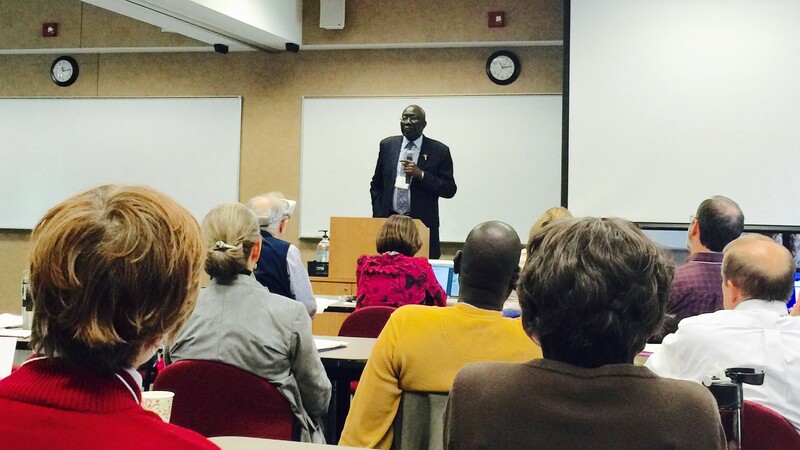 Peter, Moderator of the Presbyterian Church of South Sudan (pictured), who discussed the grave challenges of following Jesus and seeking peace in a nation struggling with tribal violence and political corruption. Here in Shenango, our Sudan Partnership Team meets monthly and is led by Denise Sciuto. 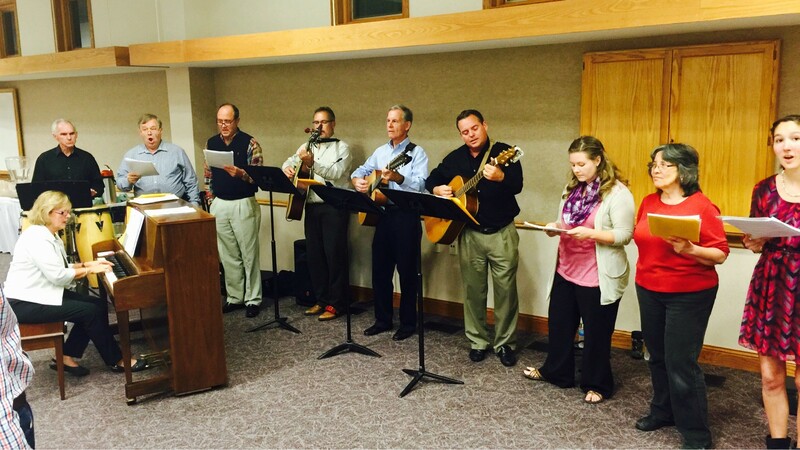 Members of the New Wilmington church Praise Team (pictured here) led worship for our pastors during our fall overnight Pastors Retreat, held at Villa Maria. Sponsored by our Leadership Development Team, our retreats offer fellowship, learning, and worship for our Teaching Elders and Commissioned Ruling Elders serving as pastors in our 49 congregations. The next retreat will be April 1-3, 2016, a weekend marriage enrichment retreat for our pastors and their spouses. Order Advent Calendars by next Friday! Join us for this FREE one-day seminar to explore your call to missions! October 31, 2015 from 9 AM – 4 PM at Pittsburgh Theological Seminary, John Knox Room. This workshop is designed to help you explore a call to mission – spend the day listening, studying God’s Word, and praying in groups. This year’s event features the Rev. Don Dawson, Director of the World Mission Initiative; Stephanie Bell, spiritual director; and Michael and Rachel Weller, missionaries in Ethiopia. RSVP by October 26 to wmi@pts.edu. This workshop is FREE, but it may cost you your life! Mt. Hermon Presbyterian Church (3116 Frew Mill Road, New Castle) will celebrate their 175th Anniversary on November 8, 2015 with a special worship service at 11:00 AM. Special music by “The Walkers”, light refreshments following. Please join us…you are a blessed part of our history. If you need to contact us, call Karen Lynn at 724-924-9431. We are celebrating Rev. Bill Crooks 35th year as pastor of Trinity Presbyterian Church, Mercer. Come join us on Sunday, November 15, 2015 following 11 AM worship to extend your best wishes and enjoy a piece of cake. Bessemer Presbyterian Church (29 N. Main Street, Bessemer) will be holding a Ham Loaf Dinner on Saturday, November 14, 2015 from 5 – 7 PM. Proceeds to benefit the Church’s General Fun. Adults $10.00, Children 6-12 $5.00, Children 5 and under FREE. Eat in or Take Out Available! Call the Church Office for tickets: 724-667-7255. Sunday, November 1st, is All Saints’ Day when we remember and give thanks for those brothers and sisters in Christ who have gone to the Church triumphant. One musical way to celebrate All Saints’ Day is with a Requiem. The Choirs of First Presbyterian Church in Sharon and New Wilmington Presbyterian Church, joined by friends from the Shenango Valley Chorale and a Chamber Orchestra, all under the direction of Edgar Groves, will perform “A German Requiem” by Johannes Brahms on Nov. 1st at 7:30 PM at First Presbyterian Church, 600 East State Street in Sharon. The Brahms “Requiem” does not follow the traditional Requiem Mass, but instead Brahms took passages of Scripture from Martin Luther’s German Bible and set them to music. Brahms wanted to emphasize the resurrection, not the judgment day, so his choices of Scripture and his music are more hopeful. It is a lovely composition, well worth hearing. This performance will be in English, and there will be program notes in the Bulletin. As a special treat, at 7:00 PM there will be “Cookies and Coffee” prior to the performance, and Ed Groves will have a brief talk about the Brahms“Requiem” to help you enjoy the performance even more. This concert is FREE and open to the public. We hope you will celebrate All Saints’ Day with us in Sharon as you listen to a truly beautiful Requiem. Tower Presbyterian Church is seeking someone willing to lead our congregation in the worship of our Lord and savior Jesus Christ. They will oversee the music programs of our church, including both contemporary and traditional worship, as well as occasional special worship services. They must have availability for Sunday worship, Wednesday night rehearsals and other occasions as necessary. Send resume to Tower Presbyterian Church, an ECO Congregation, 248 S. Broad St., Grove City, PA 16127 or clerk.towrchurch@zoominternet.net. Position available January 1, 2016.